Rdio on Friday began rolling out a new Facebook integration that allows users who sign in with their Facebook accounts to receive a free 7-day trial of the company’s desktop web music streaming program. Currently Rdio charges $4.99 for unlimited desktop streaming while mobile+desktop comes with a cost of $9.99. Buyers looking to take advantage of the trial should be aware that it only offers desktop streaming support while iOS app users will still only receive a 30 second trial, however the trial popup for the program may appear on your Apple iOS device. 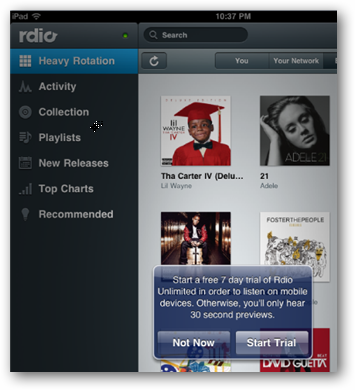 Free trial users should also be aware that Rdio is not offering unlimited streaming and they have not stipulated what the number or duration of songs under the free program entails. While the free account is limited in capabilities it’s at least a decent way for potential Rdio users to check out the system before jumping in with a paid subscription.